2 STORY, SINGLE FAMILY - ST AUGUSTINE, FL These Views Truly Do Take Your Breath Away! 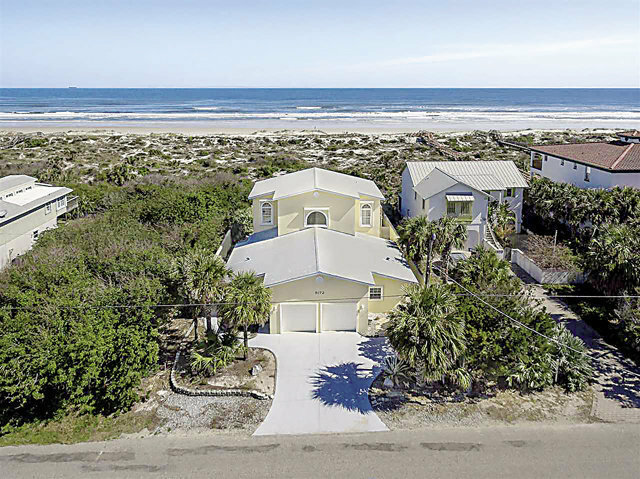 With This Desired Ocean Front Location And Over 2800 Sf W/ 4 Br/3.5 Ba,Wake Up Every Day Feeling Like You Are On Vacation. Reconstructed And Newly Modified In 1999 With Quality Construction And Plenty Of Character. Welcomed Inside By Soaring Ceilings And Contemporary Lines. Expansive Living Room Upstairs W/ Hardwood Floors Offers Panoramic Ocean Views From Large Picture Windows.turn The Corner From The Kitchen And Have Dinner On The Second Floor Deck.,Master Retreat On Entry Floor Offering 2 Walk In Closets,Separate Office/Den (could Be A Non Conforming 5th Bedroom) W/French Doors To Rear Patio,Master Bath With Walk In Shower,Door To Side Yard And It's Own Washer And Dryer. Guest Baths Completely Renovated With Tile Showers,New Vanities And Fixtures! And The Former Cottage Was Redesigned Allowing For The 2 Car Garage,Family Room With Kitchenette,3br's And 2ba's. Quality Features: Sturdy Concrete Block Up 2 Stories,Impact Windows On East Side Of Home With Shutters On Other Windows,Metal Roof In 2001,Duralock Painted Exterior,Security System,Laundry Area In Master And Next To Other Bedrooms,2 Outside Showers With Hot/Cold Water,Concrete And Vinyl Fenced Yard,Zero-scape Yard,Ccl Line Is East Of Rear Property Line,Sewer Connection At Street. Sold Fully Furnished And Zoned For Short Term Rentals.